I’ve written about this before… and I will keep writing about it, until I finally get it. We all need rest. You see, I’m a workaholic. My friends and family who are reading this are saying, “well, yeah…”. I wasn’t born this way, it’s something I trained myself to be. I was a busy, hard to keep entertained kid. But workaholic? Not so much. Looking back, I think college is what did it to me. I was taking more than a full load of credits each semester and usually working 2-3 jobs to pay my way through. After several years, it became a habit. Fast forward to today, as an entrepreneur it has only gotten worse! In addition to this loverly habit I have come to realize that I have forgotten how to rest. Just recently I was reminded of this fact. I had arranged to be out of the office for the day but through a series of events my travel plans changed and I ended up staying home. I was glad in the end, I needed a day off. By mid-morning however, I was restless (more than usual), I kept thinking I need to rest and just be but could only think of chores that needed tackling and a to-do list full of things that were weeks old. By end of the day I was thinking, what happened to finding time to rest? Well, a) I kept pushing it further down the to-do-list and b) I couldn’t think of what to do. Sitting still is hard. It may not be for you but it is for me. Thankfully, I’ve learned to channel my restlessness so it isn’t as annoying to those around me as it used to be. Cease work or movement in order to relax and refresh oneself, or recover strength. Okay, great… but what does that look like on a practical, self-application level? That was not made clear. We need time to repair: Our bodies need time to repair after an intense workout, we need time to heal after an emotional trauma, and our bodies need time to repair after sickness. We need a brain break: We are constantly on the go in high gear. We are blasted with information every day and we need time away from it all to stop our swirling, racing thought patterns. It’s an addiction. Once you get used to being constantly on the go, the living on adrenaline and the distraction it provides is addicting and hard to break away from. It’s a competition. We may not always realize it but when you hear the to-do-list of a friend, or their schedule for the coming week, our first thought goes to our list and schedule and compare it. Sometimes we even feel guilty or feel that we are doing something wrong if we are not as busy as they are. We feel guilty. We are trained to continually live with the switch turned to the on position. When we stop, we feel guilty, and feel like we need to make excuses when we are caught sitting down for a few minutes. Being constantly on the go causes us to miss out on the small beautiful moments around us and keeps our focus inward. Learning to rest will help us to start to notice our surroundings and start see beyond ourselves again. 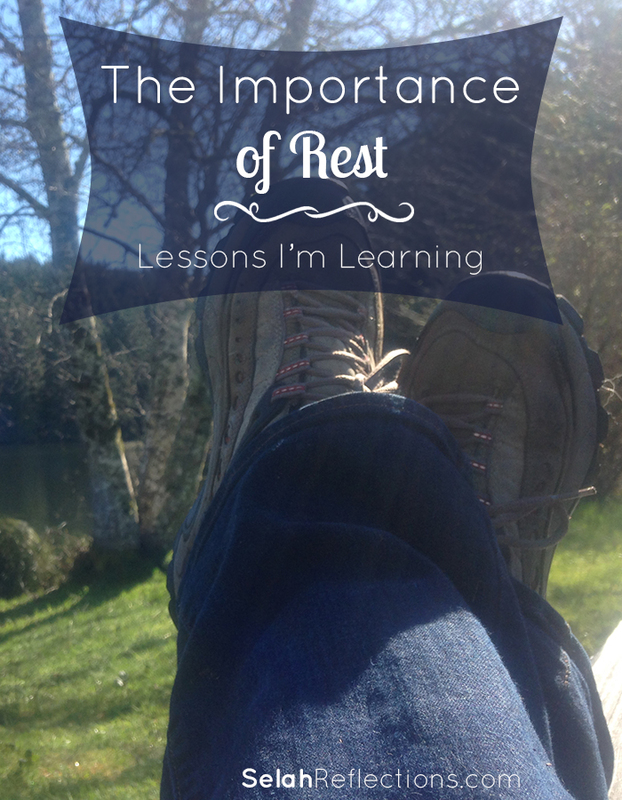 Do you know how to rest? In what ways do you rest? The dichotomy: In one sense, you have to work at resting (Heb. 4:11). If work is exerting force to make something happen, then you have to make an effort to rest. It can seem easier to go with inertia, and just keep plugging away at what “needs” to be done. Or you might do the toddler thing, and run faster and faster the tired-er you get, because if you stop, you’ll crash in exhaustion. BUT, rest is when recharging, healing, recovery and growth happen. …and of course, loads of other things. I personally find that making a point to thank the Lord for my actual blessings can change my focus and outlook. I find it interesting that resting is both a noun and a verb. There is a dichotomy for sure. There is also different levels of rest, from complete rest and sleep, to puttering around the house, to having a great conversation with a friend (or sister… :)!). Resting is also an emotional state and a mindset, taking time to express gratitude and be grateful can change a negative mindset with a downward spiral to a calmer state of being, and stop that downward spiral.